A New Bull Market, or A Secular Bear? With the market continuing to hit new highs, my clients frequently ask if I believe that we are now in a “new bull market.” First, I tell them that is is actually an old bull market, because our portfolios been primarily long the market since our months-to-years time frame, the Bull/Bear indicator, told us to get back into the market on May, 15, 2009. This indicator has served us well because it told us to get out of the market back on January 11, 2008, and on October 13, 2000, which allowed investors to miss the market meltdowns of 2001-2001, and the financial collapse of 2009. These portfolios are based on the market laws of supply and demand, they’re built on academic facts, not theories or some puffed up market hypothesis. With that in mind, let’s answer the question: Are we in a new bull market? Is this a new bull market or what? 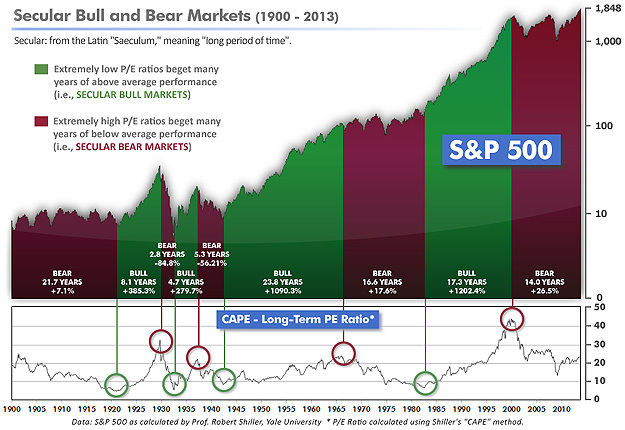 The chart clearly shows that the market moves in long term cycles called secular bull and secular bear markets. Notice how the chart changes from bear markets and then to bull markets. Also, take note that they are just about evenly split. These longer term cycles can last for years and decades at a time, and within these secular bull and bear cycles, there are smaller intermediate trends called “cyclical bull and cyclical bears.” This is where the Anthony Capital portfolios make their money, in the cyclical bull and bear cycles that occur inside of longer term secular bull and bear cycles. Where are we now? Well, as the chart shows, we are in the 14th year of a longer term secular bear market as defined by the CAPE–Cyclically Adjusted Price-Earnings ratio that was developed by Dr. Robert Shiller, professor of economics at Yale University. The current secular bear market began in 2000 when the P/E ratio peaked at around 44. The job or a secular bear market is to burn off outrageously high P/E ratios over one or two decades until the P/E ratio arrives back at a single-digit level, from which another secular bull market can emerge. If history is a guide, then we’re not done with the secular bear market. The Shiller P/E finished the week at 24, and is approximately at the level that it reached at the pre-crash high in October 2007. Even though P/E’s are substantially lower than their crazy peak in 2000, they are nontheless at the high end of the normal historical range and leave little room for expansion. This means that the stock market is unlikely to make gains greater than the corporate profit growth percentage, if that. 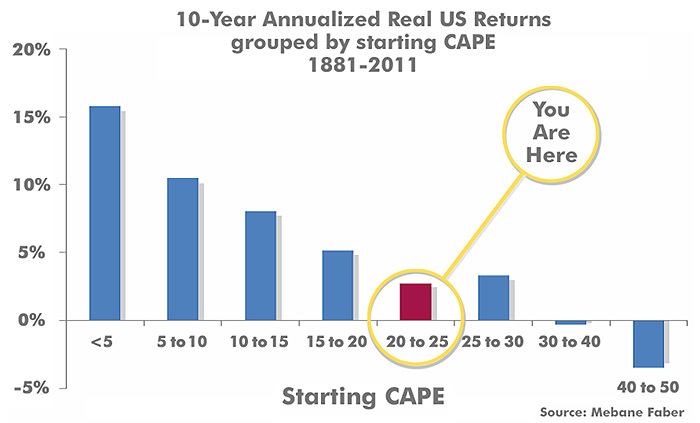 In fact, since 1881, the average annual returns for all rolling ten year periods that began with a CAPE at this level have been just 3%! Above-average returns (3%) are much more likely to come from the active management of portfolios than from a passive buy-and-hold approach. Although mania could come along and cause P/E’s to shoot upward from current levels (such as happened in the late 1920’s and the late 1990’s), in the absence of such a mania, buy-and-hold investors will likely have a long wait until the arrival of returns typical of a Secular Bull Market. So you are bearish right now? Just because we are in a secular bear market doesn’t mean that you can’t have cyclical bull markets that will fight things out with the cyclical bears. This in where our FBIAS™ Fact Based Investment Allocation portfolios make the most money, capitalizing on the intermediate bull and bear markets that exist inside of longer term secular bull and bear markets. 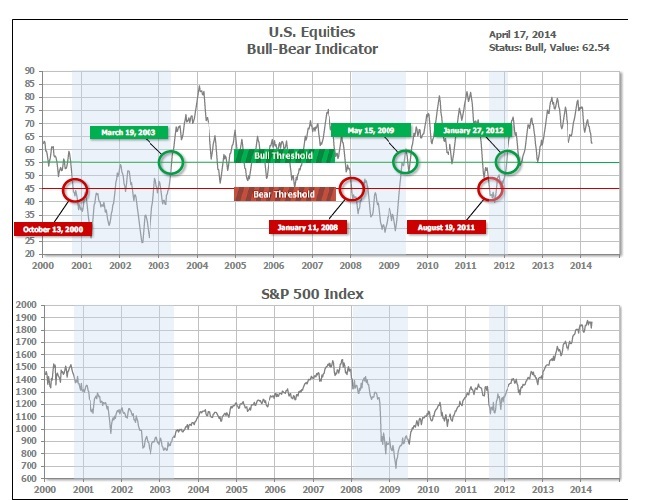 Currently, our US Bull-Bear indicator is at 62.54, and still solidly in cyclical bull territory. For the last three years, the US Bull-Bear indicator has pushed further into Bull territory than other global asset classes, replecting the higher strength of the US market relative to the rest of the world. The current cyclical bull has taken the US to new all-time highs, but most of the world’s major indices have barely matched 2011’s highs, let alone approached the 2007 levels. 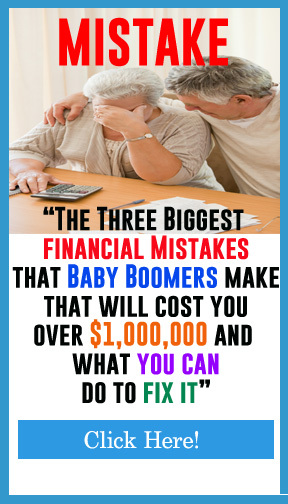 Be smart, and have a plan in place to protect your profits. If history is a guide, we may not yet be done with this Secular Bear Market. The Shiller P/E finished the week at 24.7, down slightly from the prior week’s 25.3, and approximately at the level reached at the pre-crash high in October, 2007. Even though P/E’s are substantially lower than their crazy peak in 2000, they are nonetheless at the high end of the normal historical range and leave little if any room for expansion. This means that the stock market is unlikely to make gains greater than corporate profit growth percentage, if that. (note: all P/E references are to the Shiller P/E values, sometimes called PE10 or CAPE, which are calculated so as to remove shorter-term fluctuations; see robertshiller.com for details). The “big picture” is the months-to-years timeframe – the timeframe in which Cyclical Bulls and Bears operate. The US Bull-Bear Indicator (see graph below) is at 62.5, down from last week’s 66.1, and still solidly in cyclical Bull territory. For the last three years, the US Bull-Bear Indicator has pushed further into Bull territory than other global asset classes, reflecting the higher strength of the US relative to the rest of the world. The current Cyclical Bull has taken the US to new all-time highs, but most of the world’s major indices have barely matched 2011’s highs, let alone approached 2007’s levels. The intermediate (weeks to months) indicator (see graph below) remains in positive status, ending the week at 24, down 3 from the prior week’s 27. Separately, the quarter-by-quarter indicator – based on domestic and international stock trend status at the start of each quarter – gave a positive indication on the first day of January for the prospects for the first quarter of 2014. Global markets declined for the week ending April 11th except for the new darlings of investors – Emerging Markets. Completing the reversal of roles, Emerging Markets are the only grouping of equity markets now positive for the year-to-date, whereas just a few weeks ago, they were the only grouping of markets that were negative for the year-to-date. In the US, SmallCap and Nasdaq indices continued to take heavy fire during the week, losing -3.6% and -3.1% respectively, while the Dow and S&P 500 lost -2.4% and -2.7% respectively. The Nasdaq composite index logged its third consecutive losing week, and capped the week by losing -4.6% just from Wednesday to Friday, the worst 3-day loss since 2011. The swift rotation from small-and-growth to large-and-value has resulted in an unusually wide (for this early in the year) 500 basis point disparity in year-to-date returns between the SmallCap Growth index and the LargeCap Value index. Japan was the worst market for the week, at -4.9% (and the Nikkei index closed below 14,000 for the first time in 6 months), while Brazil notched a gain of +2.7%, best among all markets of significance. Like the Emerging Markets index as a whole, Brazil has now reversed a sizeable loss for the year. Canada’s Toronto Composite Index (TSX) lost -0.9% on the week, continuing its recent run of outperformance vis a vis the US, and remains positive year-to-date. Economic news in the US was mostly positive, despite the market rout. The National Federation of Independent Business (NFIB) small business optimism index increased in March to 93.4, up from 91.4 in February and above the rise to 92.5 expected. Businesses are optimistic that sales will increase and, in addition, hiring plans by small businesses have improved. The government’s “Job Openings and Labor Turnover Survey” (with the stimulating acronym of “JOLTS”) indicated that there were 4.2 million job openings in February, up from 3.9 million in January. Job openings were at the highest level since January 2008, and join the total number of employed workers in regaining pre-recession levels. Weekly jobless claims came in at 300,000, below the 320,000 expected. It was the lowest level of claims since May of 2007. The FED minutes, released Wednesday, were dovish and played down expectations that interest rates would rise faster than previously thought. There was no reference to the suggestion that the FED would raise rates 6 months after the end of the tapering program, as Chairman Yellen seemed to have suggested in her maiden press conference. The minutes also revealed that the FED was concerned about misleading the market on interest rates. Markets rallied following their release, with the dollar and bond yields falling. The rally was immediately reversed on Thursday, with more selling on Friday. Most Canadians reasonably believe that the vast majority of their fellow citizens are all for the pipelines necessary to transport oil from the landlocked shale-oil drilling sites, but the plans for a pipeline to a deepwater port for export to the Far East were scuttled by a vote in Kitimat, British Columbia. Voters there rejected the plans by a sizeable 58%-42% margin. Now not only is the Keystone XL pipeline to the US under fire, but the home soil is not so welcoming, either. Inconceivable as it was just a couple of years ago, both Greece and Spain have found ready buyers for new bond issues – and the coupon carried by the Spanish 10-year debt was only slightly higher than the equivalent US note! Deflation worries are not just for Europe – China is now wrestling with the prospect of deflation in the goods-production segment of its economy, too. The Producer Price Index (“PPI”) fell -2.3% for March, worse than expected and worse than February’s -2.0%, and marks the 25th consecutive month of falling producer prices. Chinese year-over-year exports dropped -6.6% in March when +4% was expected, but many observers discounted the significance of the large decline, saying it is a natural result of the Chinese government’s laudable attempts to root out double-counting and other paperwork tomfoolery that had been routine until a year or so ago. The average ranking of Defensive SHUT sectors declined to 12.3 from the prior week’s 11.8, while the average ranking of Offensive DIME sectors rose slightly to 12.8 from the prior week’s 13. The Defensive SHUT sectors kept their slight lead over the Offensive DIME sectors. If history is a guide, we may not yet be done with this Secular Bear Market. The Shiller P/E finished the week at 25.3, down slightly from the prior week’s 25.6, and approximately at the level reached at the pre-crash high in October, 2007. Even though P/E’s are substantially lower than their crazy peak in 2000, they are nonetheless at the high end of the normal historical range and leave little if any room for expansion. This means that the stock market is unlikely to make gains greater than corporate profit growth percentage, if that. (note: all P/E references are to the Shiller P/E values, sometimes called PE10 or CAPE, which are calculated so as to remove shorter-term fluctuations; see robertshiller.com for details). The “big picture” is the months-to-years timeframe – the timeframe in which Cyclical Bulls and Bears operate. The US Bull-Bear Indicator (see graph below) is at 66.1, down a little from last week’s 66.9, and still solidly in cyclical Bull territory. For the last three years, the US Bull-Bear Indicator has pushed further into Bull territory than other global asset classes, reflecting the higher strength of the US relative to the rest of the world. The current Cyclical Bull has taken the US to new all-time highs, but most of the world’s major indices have barely matched 2011’s highs, let alone approached 2007’s levels. The intermediate (weeks to months) indicator (see graph below) remains in positive status, ending the week at 27, up from the prior week’s 25. Separately, the quarter-by-quarter indicator – based on domestic and international stock trend status at the start of each quarter – gave a positive indication on the first day of January for the prospects for the first quarter of 2014. The month of March marked a literal turning point for the markets: investors turned away from previous high-flyers and turned toward more value-oriented opportunities. The two indices that had led the market higher before mid-March, the Nasdaq and Russell 2000 Small Cap indices, were sold hard and turned in negative performances for the month (although each retained a slight gain for the quarter). Companies whose names had been in the financial news daily for their skyrocketing share prices had the stuffing beaten out of them in the final days of the quarter. Netflix, Tesla, Priceline, Amazon, Twitter, Facebook as well as a host of biotechs were sold down 20% to 40% from their highs reached just a few weeks ago. For the first quarter, all US indices were higher save for the Dow Industrials, down less than a percent. The Nasdaq and SmallCap indices finished the quarter well off their highs, and only slightly positive for the quarter. The S&P 500 at +1.3% and MidCaps at +2.7% were the only US indices to finish the quarter with gains of more than 1%. In a reversal from last year’s underperformance, Canada’s TSX index smartly outperformed the US for the first quarter, turning in a +5% gain. Canada’s gains were largely driven by gains in natural resources (energy and metals), and Canada has not experienced the whirlwind rotation that has roiled the US markets. Developed International experienced a slight loss for March at -0.5%, and a slight win for the first quarter at +0.2%. Continuing the “first shall be worst” theme, Japan – the biggest developed market gainer of 2013 – dropped -9% in the first quarter. Emerging International was the beneficiary of the rotation to value, as P/E multiples in Emerging Markets have been the most attractive in the world so far this year. The sudden rush to Emerging Markets in March resulted in a +3.9% gain for the month. Even that gain, added to a similar gain in February, was not enough to get to positive territory for the quarter, however, and Emerging Markets finished the quarter at -1.9% but rapidly rising. For the week, which contained the first 4 market days of April, markets were generally but modestly positive. Exceptions on the downside were the Nasdaq, hit with more selling of previous high-flyers, and on the upside were many countries in the Emerging Markets group, continuing their sudden outperformance. Brazil, in particular, shone among the Emerging Markets with a +3% gain for the week. US economic news was dominated by the Non-Farm Payrolls (“NFP”) report on Friday. It was neither hot nor cold, at 192,000, but it did mark one milestone: all the 8.8 million jobs lost in the recession have now been recovered albeit in painfully slow fashion. Interest rates dropped lower on the NFP news, in anticipation that the Fed’s easy money policy would not be threatened by such a tepid number. The job gains were entirely in the private sector, as government hiring was nil for the month. Janet Yellen, backpedaling from her unguarded “6 months or so” comment of two weeks ago, said more reassuringly that the “economy needs extraordinary support for some time”. Statistics Canada reported a surprising 42,900 job gain for March. This was received positively by Canadian markets and currency, even though the number was not all it seemed. First, 30,100 of the jobs were part-time, and second the vast majority – 39,300 – were public sector government jobs while only a tiny 3,600 were in the private sector. Nonetheless, the Loonie rose to its highest level in six weeks. In the Eurozone, central bankers are newly fixated on their surprising inability to nudge inflation to their targeted 2% level. Reported at just +0.5% annualized for March, this low level is too close to deflation for comfort, and Mario Draghi reassured the market that the European Central Bank would use both conventional and unconventional means to try to muscle inflation to a more comfortable higher level. Deflation is already evident at the wholesale level, as the Producer Price Index was reported at -1.7% year-over-year through February. The average ranking of Defensive SHUT sectors stayed at 11.8, the same as the prior week, while the average ranking of Offensive DIME sectors rose to 13 from the prior week’s 15.3 (mostly due to gains in the “E” of DIME – Energy). The Defensive SHUT sectors still have a slight lead over the Offensive DIME sectors.